Many parents put in a lot of thought into what preschool activities their child will do thinking that what their child learns there will have a huge influence in how they do in elementary school and beyond.It’s true, however not in the way you may think. I hear “my 3 year old can already read,” or “my 4 year old already knows how to multiply.” That truly is great! I love kids that love to learn. But it should not be the main focus for a preschooler. Studies have shown that focusing on academic knowledge early on is not what’s going to ensure that your child does well in school. What WILL have a great impact on their success is their social-emotional development. How they treat themselves and others has a greater impact on their success in life. And starting early on that development will make it easier for them to be in a school setting and work with their classmates and teachers. Even if you homeschool, your child will be meeting other homeschoolers and will need to learn how to make and keep friends. And ultimately we want them to become adults who know how to deal with their emotions, get along with others, and be an overall good person. Responsibility for Self and Others – Do they exhibit responsibility for their own well-being,? Do they respect the class environment and rules? Do they understand how give-and-take happens in a group? Prosocial Behavior – Do they show recognition of and empathy for the feelings of others? Do they show ethics, sharing, cooperation, caring gestures, and compromises for cooperation and group harmony? These skills sound like a lot for a 3-5 year old to fully master, but they don’t have to do it right every time. They just need to show they know what’s expected of them and that they’re working toward mastering these skills. Kindermusik classes at My Little Conservatory are designed to introduce this skills in a play-based way and allows them to develop these skills in a safe environment with loving adults to help guide them. There is so much research out there that shows children’s self-esteem is tied to how competent they see themselves overall. Enrolling your child into a Kindermusik group music class gives them the opportunity to become competent in the skills they learn through the series of classes. And by becoming competent in those skills, confidence will follow. They will learn that at first they didn’t know how to do something, but with practice over time they were able to do it. For example, in a Kindermusik class, they will be given drums to play in whatever way they want to play them in order to mimic the music that we are learning about. There is no right or wrong. The right way to play is however they define it. This helps build their confidence. Kindermusik is also designed to help children explore their emotions. While listening to music they’ll empathize with the songs’ characters, identify moods in pieces of music, and, over time, develop impulse control. Also, by being in a group they will learn to better interpret people’s facial expressions, tone of voice, and body language. They become more comfortable expressing themselves and their feelings. Of course every child is different and learns at a different pace. But you may see that by the time they’re 5 your quiet child will come out of their shell because of their participation in a group music class. Have you seen Pixar’s Up? Do you remember the scene with the dog with the talking collar that gets distracted by the squirrel? Every 5 minutes he yells “Squirrel!” and pulls himself out of a conversation or what he’s doing. Toddlers have a tendency to be like that dog. Something catches their eye, and they want to go explore it. But that’s not always appropriate, or safe. Some days it might feel like they’ll never learn self-control, but they can learn it through play. Guided play helps children learn self control. And researchers found that the activities in Kindermusik group music classes are ideal for practicing and developing self control, because they require children to make changes in their behavior in a systematic way. Activities such as responding to changes in pitch or tempo, speeding movement up or down, taking turns on an instrument, and even choosing their instrument and cleaning up at the end of class. The studies also show that the types of activities done in Kindermusik classes contribute to school success. Through Kindermusik your child is learning self-control while the brain’s control skills are maturing. Their self-control skills will be better developed by the time they enter elementary school when it is most needed. Children who can control their impulses, follow directions, and focus on a task are more likely to be ready to learn and do better in school. Getting along with people is one of those soft skills that is harder to learn as you get older. So the more opportunity you have to model positive social interactions and develop positive connections for your child, the more likely your child will follow your example. These soft skills (prosocial behavior) can be hard to learn for some, but once modelled for your child in controlled environment it’s easier for them to do it themselves. Research has shown that groups who have engaged in musical activities are more confident and better adjusted than groups who engage only in traditional, non-group, non-musical activities. 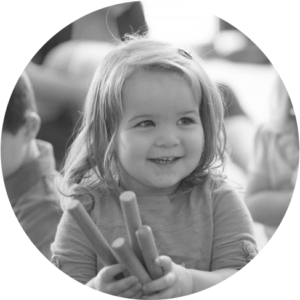 * Kindermusik group classes offer the ideal environment to foster positive interactions and connections with others. Even if you feel like you as the caregiver are more introverted, Kindermusik classes make it easier to develop connections with other caregivers in the classes. Activities in class give both you and your child chances to model cooperation, conversation, group movements, holding hands and being less self-conscious. And by learning to interpret music’s characteristics (rhythm, intonation, stresses), it can help them better interpret people’s emotions during their interactions with them. These soft skills that your child learns through Kindermusik group music classes are the foundation for their success in school and life. When they know how to engage successfully with other children, develop friendships, and gain entry into the peer groups they choose, they will be about to navigate elementary school and life. Every child is different, and reaches milestones at different times. If you are concerned with their development, please speak with your pediatrician. *James, A.R. (2000). When I listen to music. Young Children, v55 n3, p36-37.